Halfway between Biloela and Monto Queensland, on the Burnett Highway, Cania Gorge National Park is a landscape carved out of sandstone by water. 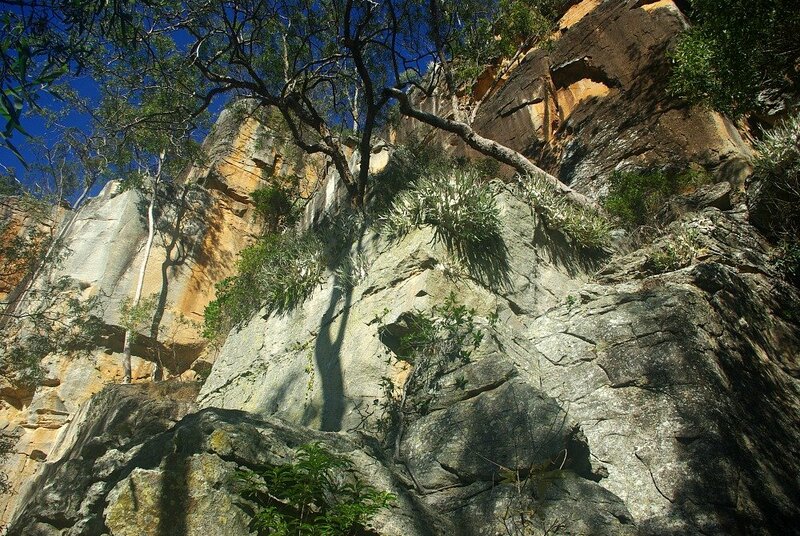 It is 3000 hectares of sandstone rock faces, towering gums, open woodland and fern fringed secluded pools. 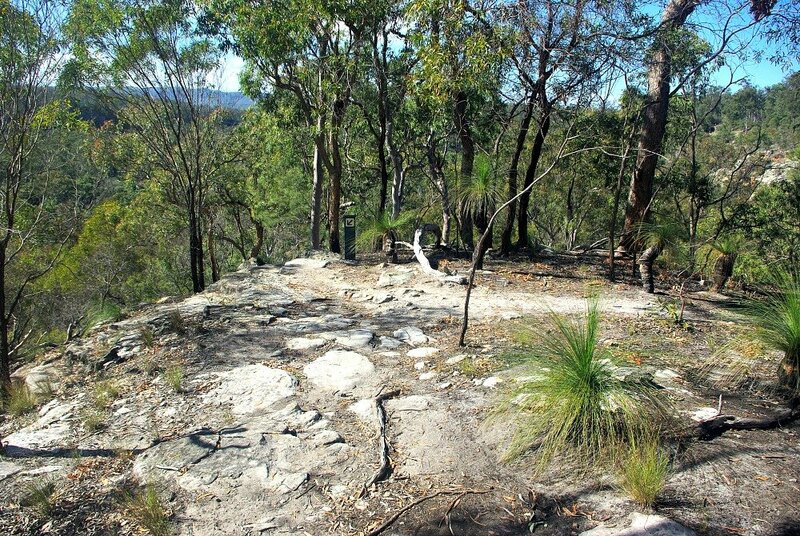 The gorge has eight well-signed and maintained walking tracks ranging from 20 minutes to 8 hours duration – some complete with picnic table. King Orchid Crevice. Perfect for Pinning. 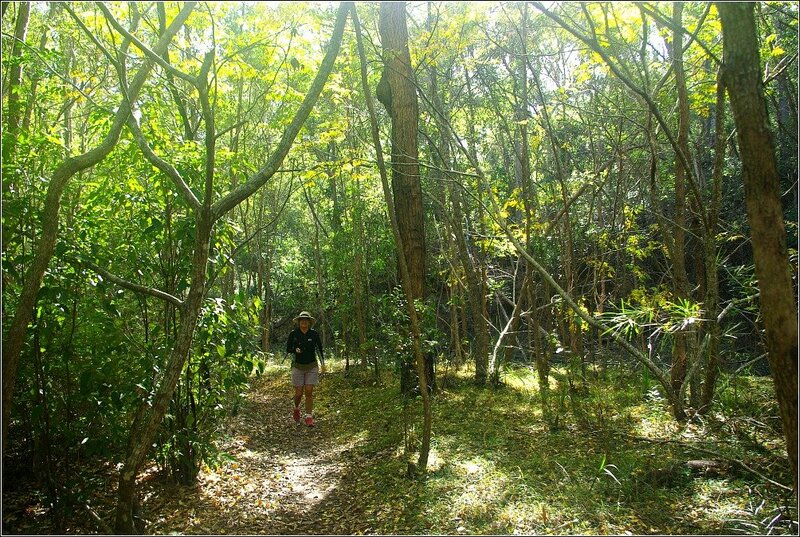 Cania Gorge Walks – BTT Tested*. 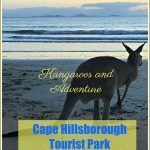 Cania Gorge Tourist Retreat – Best Budget Option. Cania Gorge National Park and Kroombit Tops National Park Location. How to access Cania Gorge National Park. All but one of the walks are orientated from the southernmost and largest picnic area. Those marked with an asterisk are reviewed in the following section. You can see a map of the Gorge Walking Tracks here. 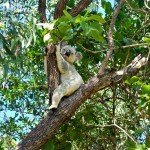 A description of all eight walks can be found in this National Park Qld link. 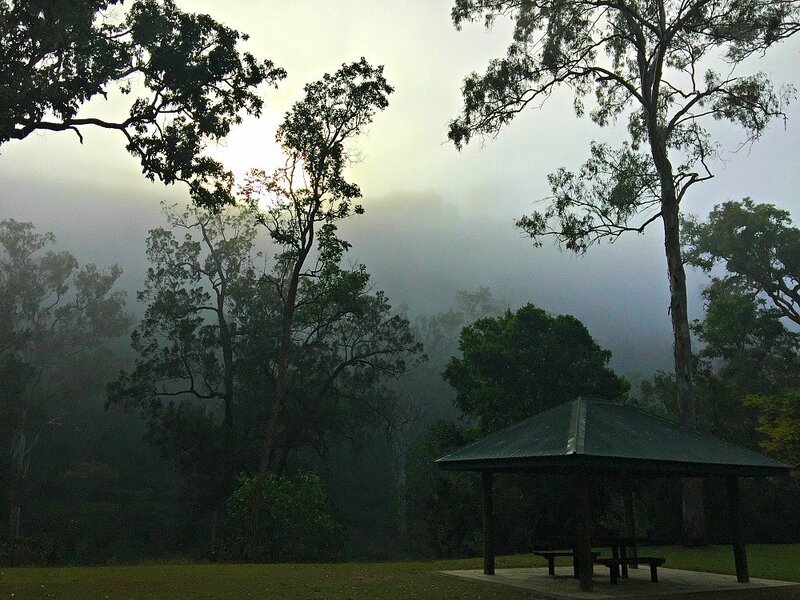 Picnic Area Circuit – 300 metres – Easy walk beside Three Moon Creek leaving from picnic area. 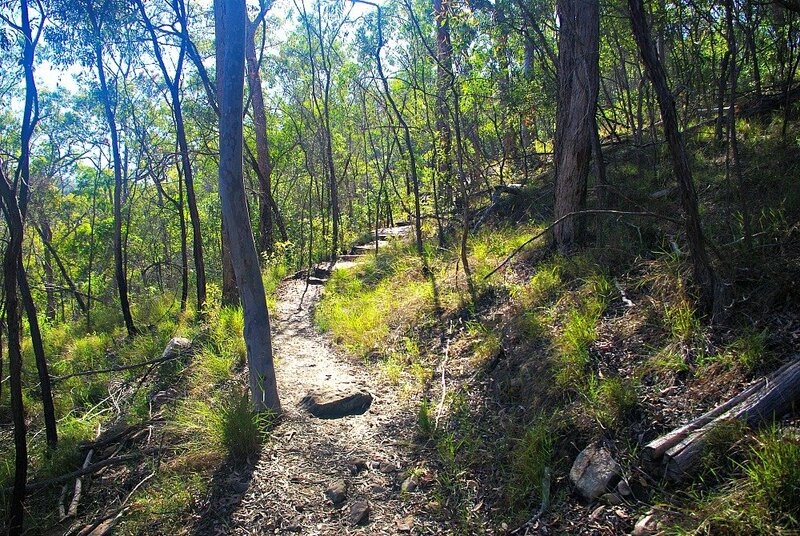 Big Foot Walk – 1 km return – 20 minutes – Leaves from the carpark 900m south of the picnic ground. 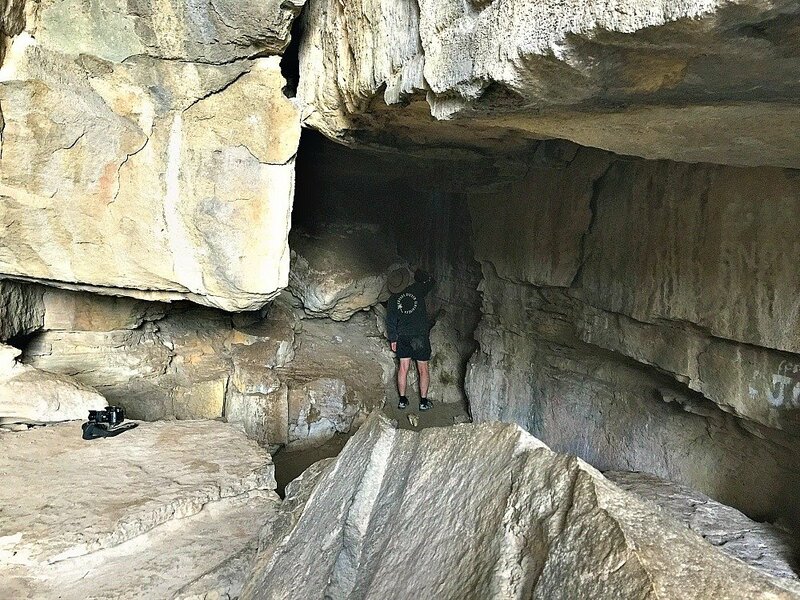 Two Storey Cave Circuit * – 1.3 km return – 45 minutes. Leaves from the carpark opposite the picnic area. Shamrock Mine Site * – 1.4 km return – 45 minutes. This one leaves from the northern carpark 1km south of Lake Cania. 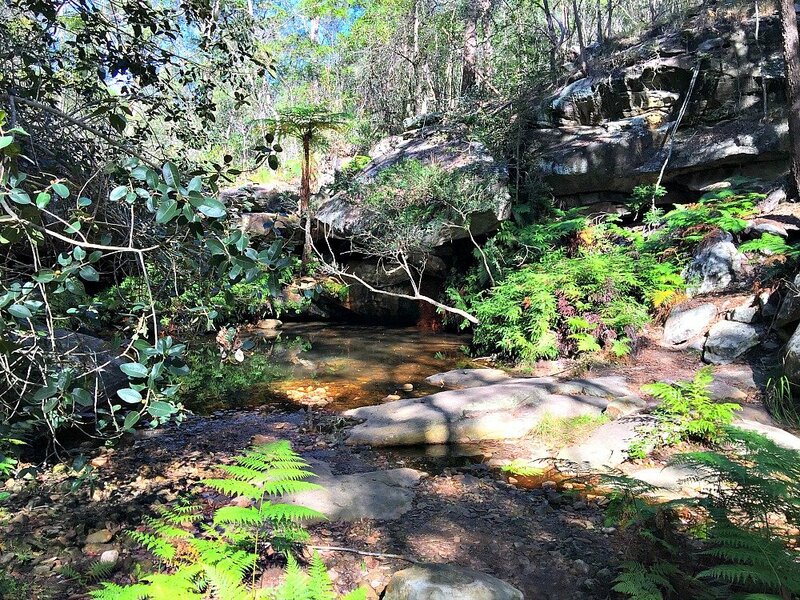 Dragon Cave and Bloodwood Cave – 2.6 km return – 1 hour. 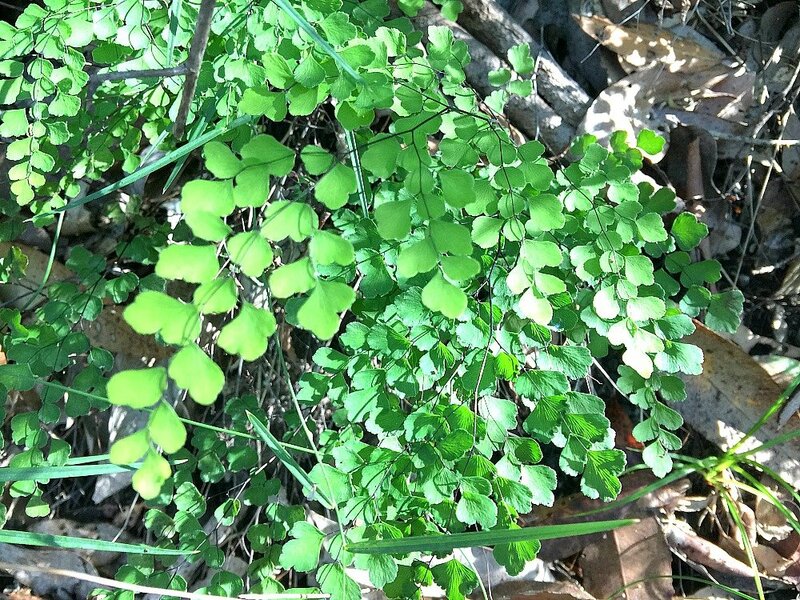 Leaves from the picnic area. 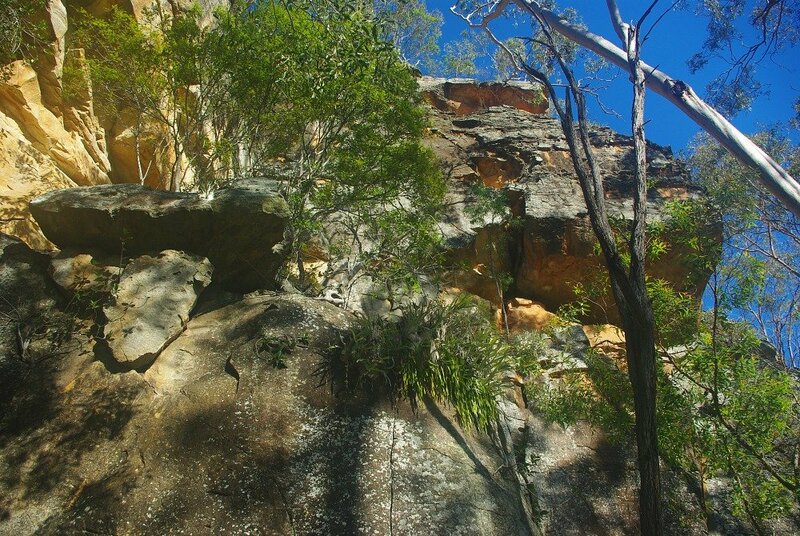 Dripping Rock and the Overhang * – 3.2 km return – 2.5 hours. Leaves from the southern end of the Picnic Area. 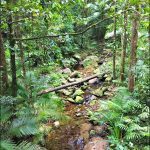 Fern Tree Pool and Giant’s Chair Circuit * – 5.6 km return – 3 hours. The circuit begins 900m south of the Picnic Area. Best Walked anti-clockwise. 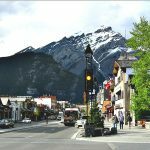 Castle Mountain – 22 km return – 7 to 8 hours. Leaves from the Picnic Area ascending to Gorge Lookout and then 10km to Castle Mountain lookout. Bring Sunscreen, Hat and more water than you anticipate needing. We did four walks in 1.5 days, arriving mid day on Day 1 and leaving mid morning on Day 3. After setting up camp, having a rest and afternoon coffee we set out on our first walk, Dripping Rock and Overhang at 3.15 p.m.
Dripping Rock and Overhang. 3.2 km. Winter light fades fast in the gorge and we set off at the latish time of 3.15 pm. Although the cliff face at the Picnic Area was in bright sunlight, down below it was already looking dark. There was no way I wanted to be finishing this walk in the dark so instead of my usual dawdle, I set off at a cracking pace. We finished in 1 hour 45 minutes as opposed to the suggested time of 2 hours 30 minutes, even with a fair amount of steps in short bursts. Amazing. Starting from the southern end of the picnic area, a footbridge crosses the shallow but swift Three Moon Creek. 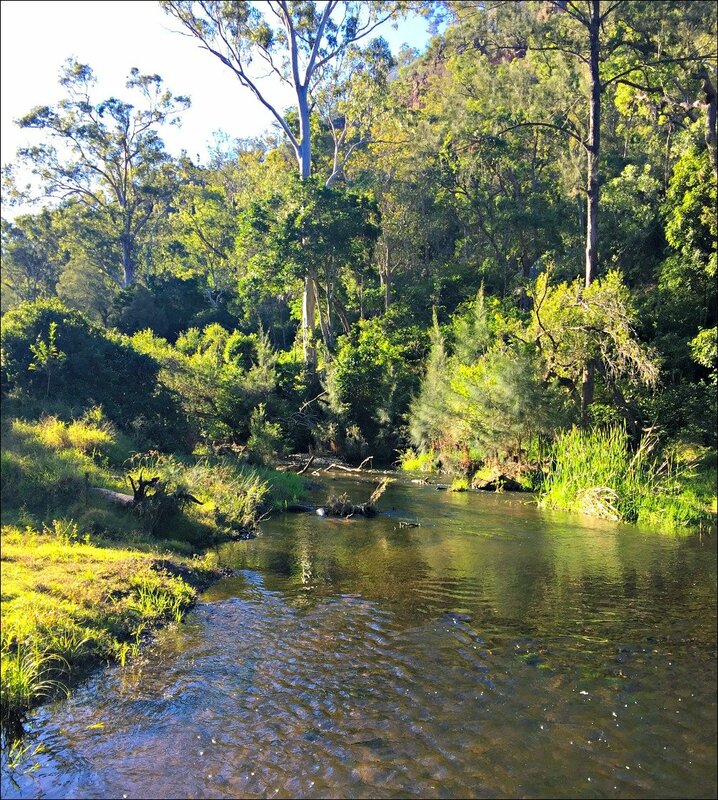 We hoped to find a small colony of Platypus in the creek but later discovered they live kilometres away in the water holes beneath Cania dam wall. 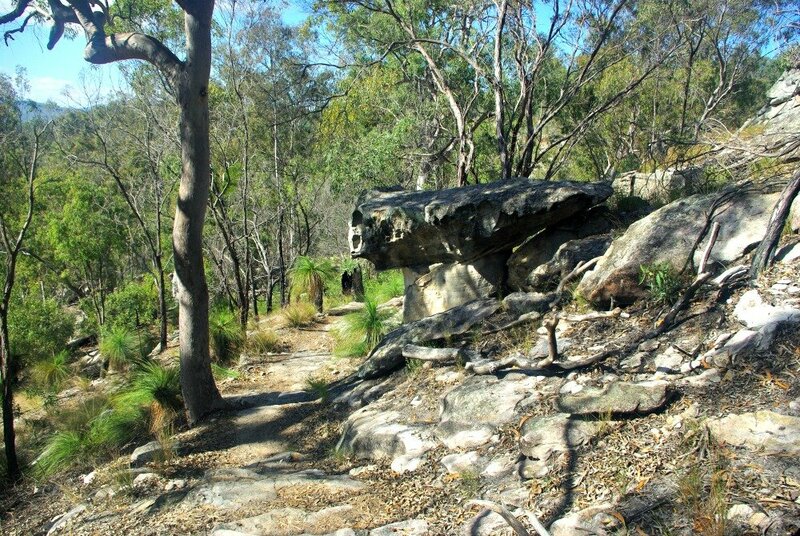 The track leads through Eucalypt and dry rainforest with eye-catching colours in the dry rocks along the way. 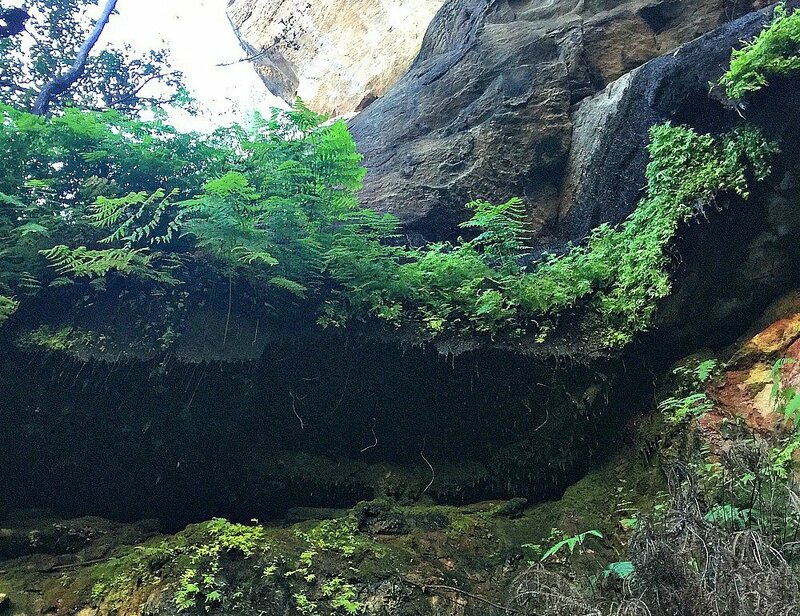 Oozing water, Dripping Rock has the perfect environment to nurture moss and ferns. 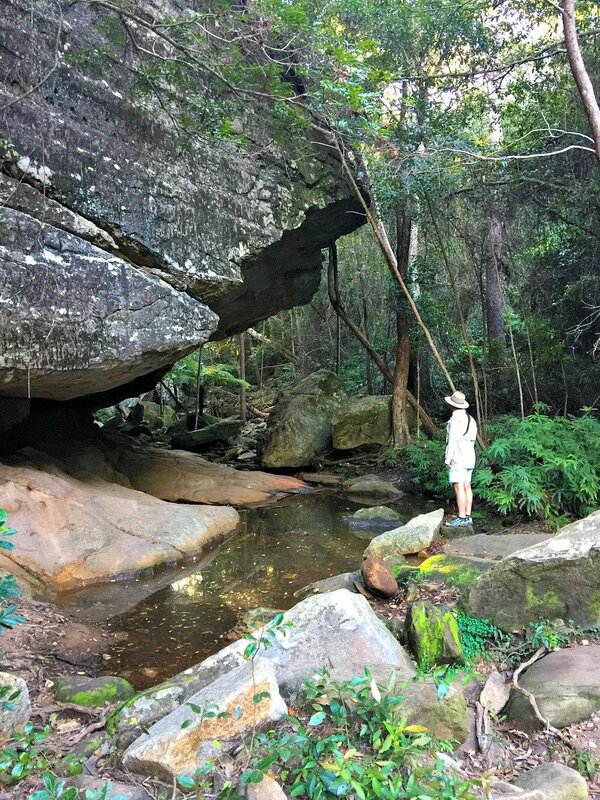 The towering rock Overhang with it’s greenery, shallow pool and cathedral ceilings, is a fitting finale to the walk. On the return trip, you might see Whiptail Wallabies standing quietly alert in the long grass with joeys in their pouches. Whiptails are more colourful than the usual wallabies. 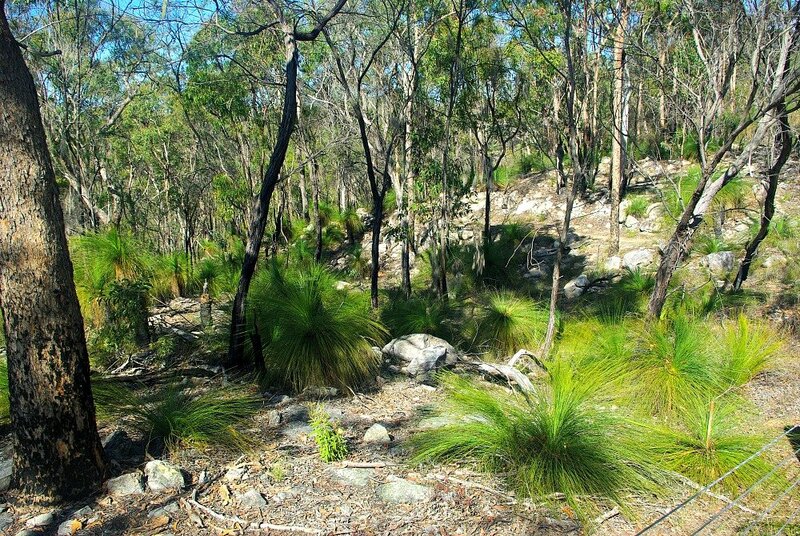 We saw Whiptails and ordinary brown wallabies both on the flats and on our hill walks. Parrots and fly-catchers flitted through the trees along with others we couldn’t name – there are more than 130 species. Lace Monitors (goannas) grow to more than 2 metres. They are great climbers and thankfully will scale a tree rather than meet you on a trail. We didn’t see any but then we didn’t spend time in the picnic area! On the other end of the scale minute rainbow skinks hunt insects in the leaf litter. I caught them as a child in the cracks of brick walls – imagine how they would love the myriad of sandstone cracks here. If you have time just sit and watch for the flash of colours on their skin. Skinks lose their tails to escape capture – it regrows! Tree Fern Pool and Giants Chair walk. 5.6km. Walking anti-clockwise with the steep descent at the finish makes this walk very achievable. Personally I wouldn’t tackle it in the other direction although we did pass one couple who did just that. 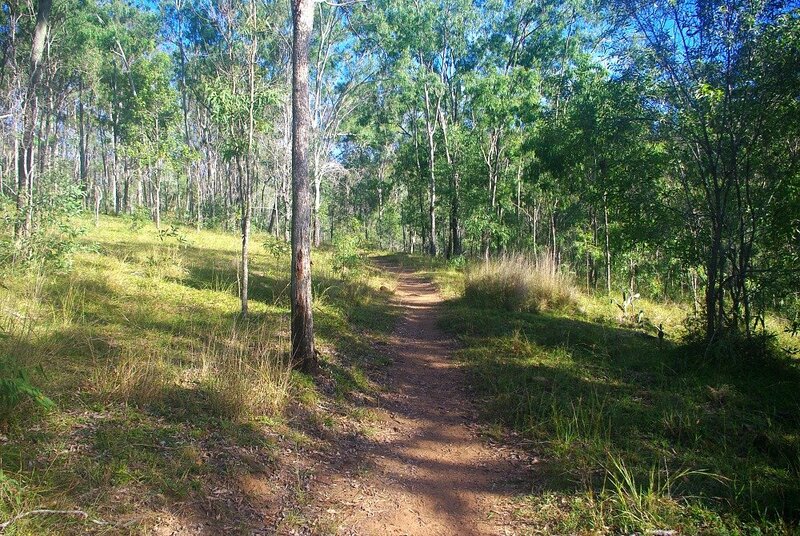 The path criss-crosses the dry Doctor’s Gully meandering through tall trees before entering the maiden hair sprinkled rainforest. Tree Fern Pool is very much like a fairy glen plonked into the forest and quite unexpected. After the pool is this strange section of forest, made beautiful by the carpet of yellow falling leaves. I am not a fan of steep inclines so the gently sloping track to the top of the range won me over. Once there everything opens up and it’s a peaceful stroll on a track wide enough for vehicles – I’m sure the park rangers use it. Down in the gorge phone signal is hard to come by, but from here to Giants Chair my Optus worked fine. Giants Chair looks out over tree tops with glimpses of the gorge road below. It’s a good view of the Aussie bush, which I appreciate so much more having travelled the world. A picnic table and barricade precede the wide rock ledges that beg for illicit photo shoots. 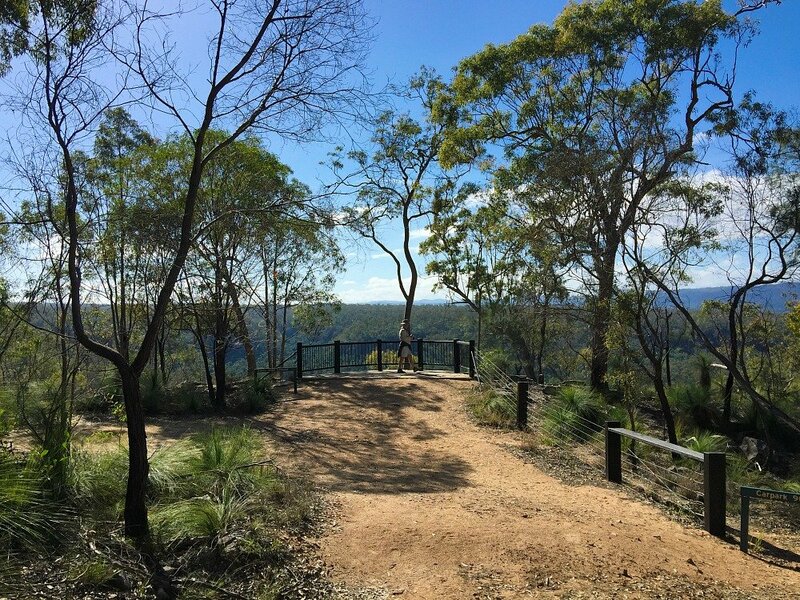 From the lookout it’s a short walk through open bush and a massive grass-tree grove to a flat rocky stage where the track drops clean over the edge – more or less straight down to the carpark, via rock steps and gravel track. Can you see the arrow on the green post below? The track disappears right there! The Tree Fern Pool and Giants Chair walk features grass trees from the start and they become more prevalent as the walk progresses. They’re different to those we know from North Queensland, being an unusually bright, almost lime green colour – quite stunning really. Verdict: If I could only do one walk I’d choose the one above. 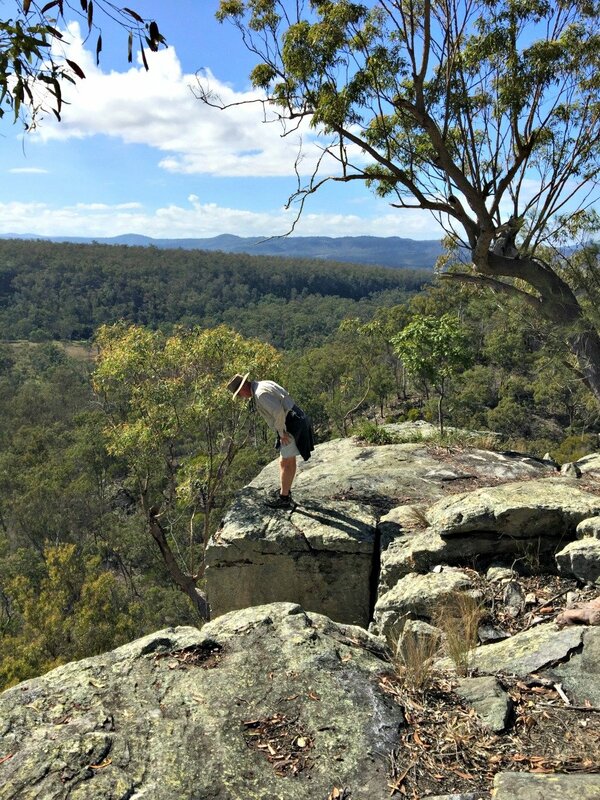 It is long enough to give a sense of achievement, has the pretty fern pool, gorgeous grass trees, tall gums and an overview of Aussie bush from the lookout. Shamrock Mine Walk. 1.4 km. Another afternoon walk for us, we stopped off after exploring Lake Cania. 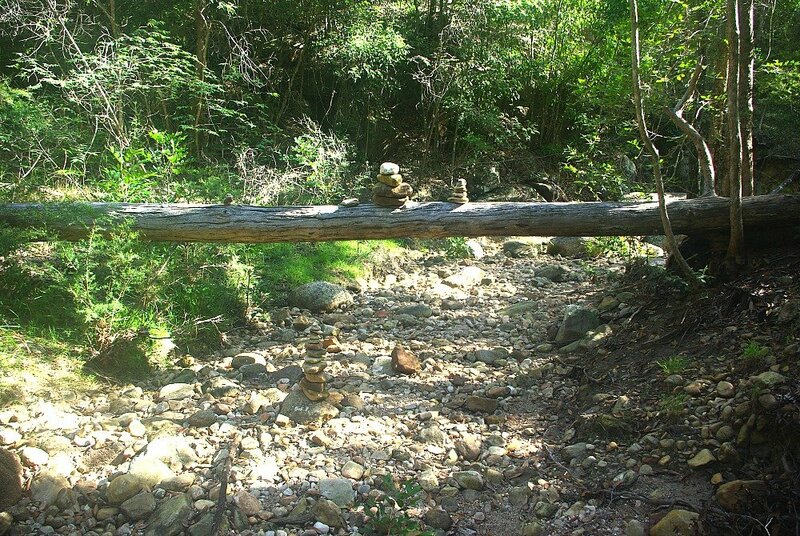 The track starts at a cluster of information boards and takes an easy route by a dry creek bed. The remains of the mine are found toward the end of the walk at the base of and leading up a small hill. The battery was removed from Cania township before submersion by the dam and relocated here. 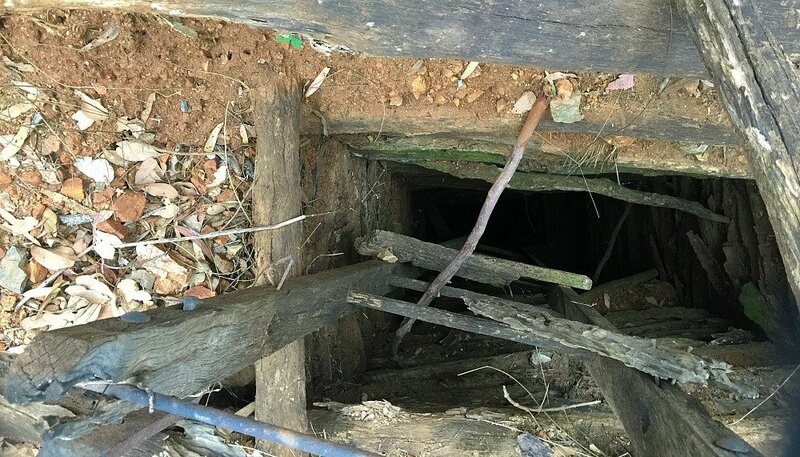 Peering into the old mine shaft (covered by safety grid) made me shiver and be thankful I’m no miner. Cattle roam the site and there are tracks, possibly made by the cattle themselves leading off through the bush. I was very tempted to follow and see where they led. The return is via the same access track. Note: Fossicking is not allowed. Verdict: This is a pleasant easy walk but the mine remains were not as significant as I anticipated. Being a gentleman Marty left the choice of the final walk to be reviewed up to me. Naturally I consulted with experts – a group of school kids who completed every walk over a 4 day period carrying all their gear, tents and walkie talkies. When prompted they chose Two Storey Cave and the Giant’s Chair Walk as their favourites. As we’d already done Giant’s Chair my choice was easy. Two Storey Cave Circuit. 1.3 km. After a bitterly cold night we awoke to a camp shrouded in mist. It started thinning as we struck camp, but at the picnic area further into the gorge, the mist lingered. Never mind – across the road from the Picnic Area at the starting point of the Two Storey Cave circuit, the sun was making inroads. We did the loop anti-clockwise. 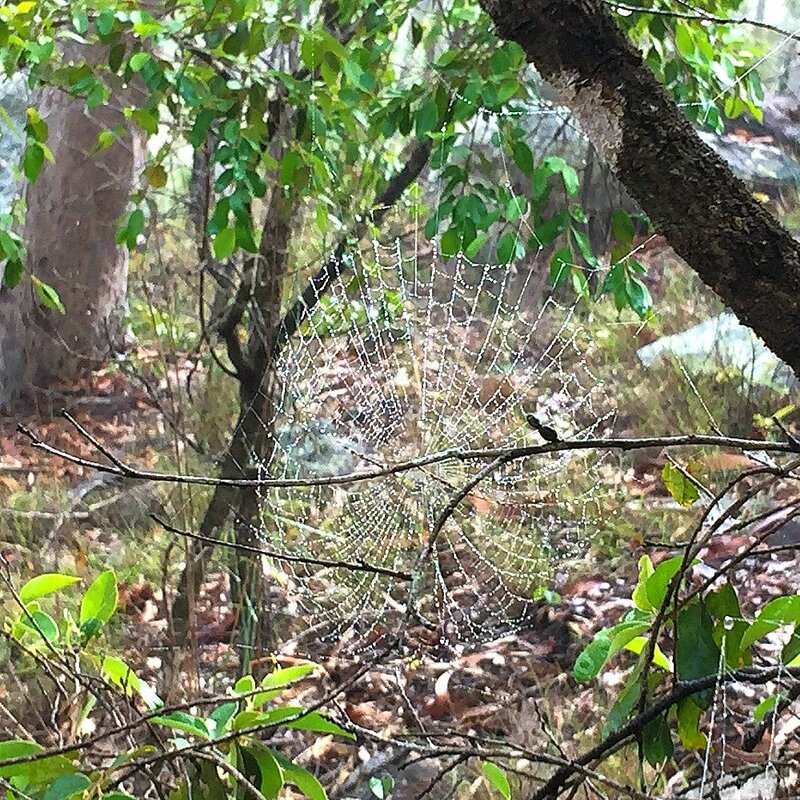 The track climbed gradually through tall spindly gum trees, cruising by a huge black rock face and a cute array of spider webs. I can see why the boys found the cave exciting, but I was slightly meh… we climbed to the next level. Marty’s long legs made it in two footholds… I considered wimping out, but I knew you wouldn’t like that. I may have whimpered, but soon I was proudly dusting off my knees and checking out the large gumtree growing from the cave. In a rear chamber about 20 micro insect eating bats hung from the ceiling – Shhhhh best not to disturb. Getting back down was scary and I hurt the muscle above my knee, but I made it in one piece. Woohoo! On the Second Floor of the Cave – where the bats are. Just when I thought the walk highlights were behind us, the track arrived at the base of a bright sandstone cliff face. For days we’d been gazing up to these stunning rocks and now without warning we were there. But wait – there’s more – the very cool King Orchid Crevice. Here the rock face has kind of shifted ajar forming a dramatic steep sided alleyway. See photo of the crevice at the page top. As I entered Marty wondered out loud if the wall might actually snap shut without warning… uncool. 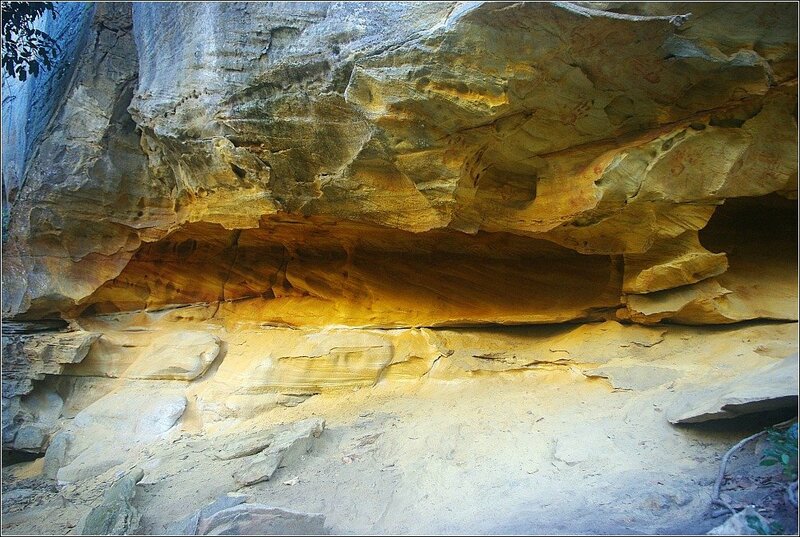 The crevice is typical of how water infiltrates cracks in the sandstone and erodes the rock till large straight blocks slip apart. Epiphytes (a desert-like version of elk-horn ferns) grow up high in a kaleidoscope of blue and orange. 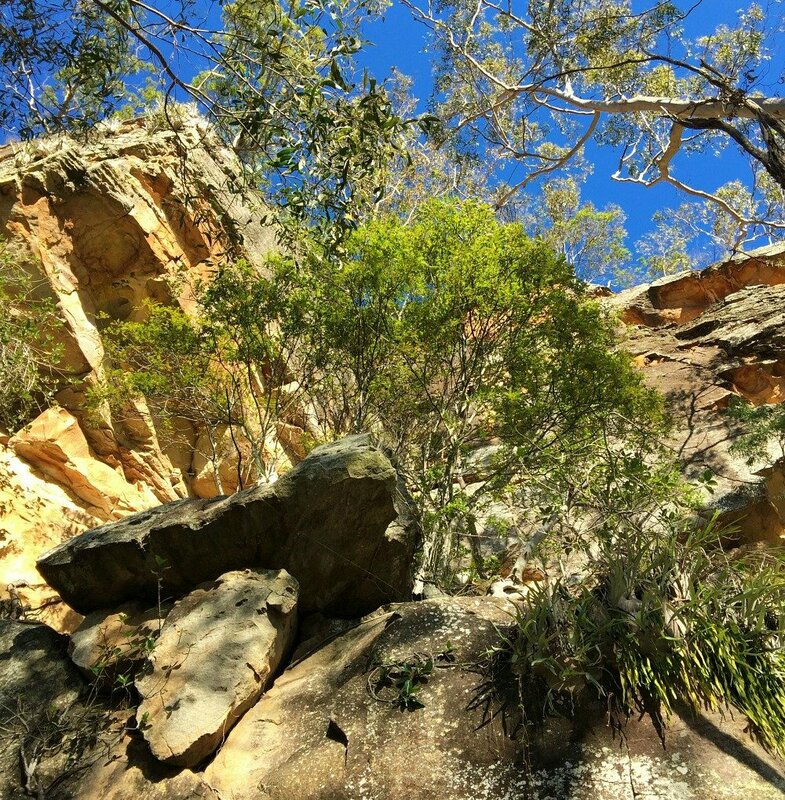 We climbed whale sized rocks, got excited over the sandstone colours and stood in awe of the trees. One hour and a gazillion photos later we arrived back at the start point. Even though the walk durations are always over-estimated we actually took longer than the 45 minutes suggested on this walk. I think that says it all. Verdict: I loved this walk for the rock face alone. I could’ve spent hours up there and if I had a picnic in my backpack I’d lounge even longer. If you love rocks this walk is for you. 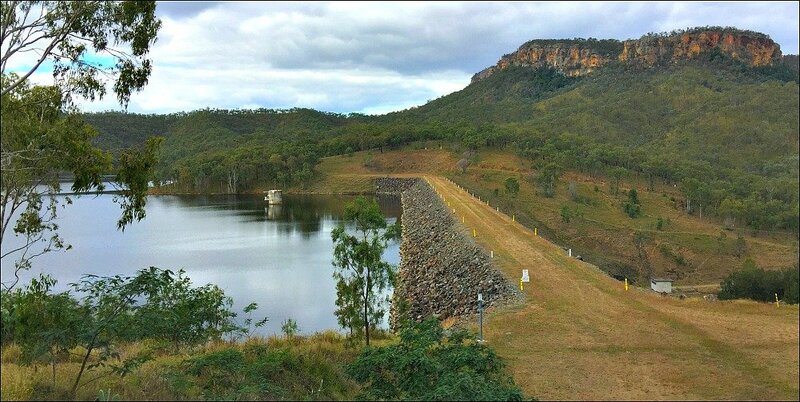 11km north of the main picnic area, Lake Cania is managed by the North Burnett Regional Council. Manicured lawns, slope down to the lake which is a popular water sports venue for swimming, boating, waterskiing, wind surfing and fishing. From the shores of the lake and from the lake lookout there are stunning, awesome views of Castle Look-out where the 8 hour walk ends. My little school buddies told me that when you cooee from Castle lookout it can be heard down on the shore of Lake Cania. For a view of the Lake I suggest driving or walking up to the Cania Lake lookout. 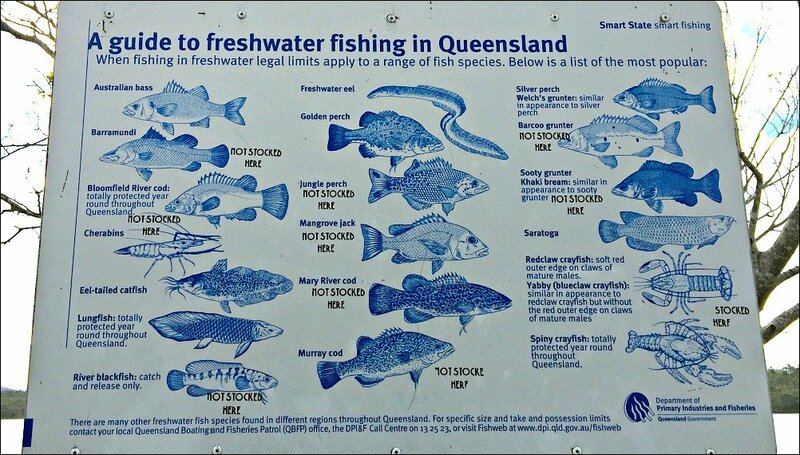 Catches include Golden and Silver Perch, eel-tailed catfish, spangled perch, snub nosed gar and the favourites Saratoga and Bass. Redclaw (freshwater crayfish with one red claw) can also be caught in traps. They are similar to Marron in W.A. and in dams on the Murray River in Victoria. We’ve caught many Redclaw when camping at Lake Tinaroo on the Atherton Tablelands and they are simply delicious. We boil and peel them and then prepare them in different ways. Garlic butter or Chilli Plum Redclaw anyone? Our camp-ground host recommended the Bass from Lake Cania as a good eating fish. He swears they don’t have that muddy taste that impounded fish sometimes have – just clean tasting white flesh. The dam is stocked three times each year. Read more about purchasing the Stocked Impoundment Permit (SIP) required for Lake Cania Fishing here. Fish from the shore, canoe or use the boat ramp to launch your motor or sail boat. Fuel and phone are available 4km back at Cania Gorge Big 4 Caravan and Tourist Park. 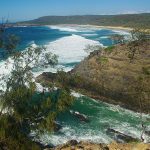 Camping is not allowed in the National Park as such, but there are two good caravan parks just outside of the National Park boundaries. Position. Directly outside the National Park entrance. It is the closest accommodation to the Picnic Area where all the walks except Shamrock Mine, commence. Reviews. It has good reviews on WikiCamps App. Facilities. Powered and unpowered campsites, fully self-contained A/C Cabins (some of which are painted with bush scenes and named accordingly, i.e. 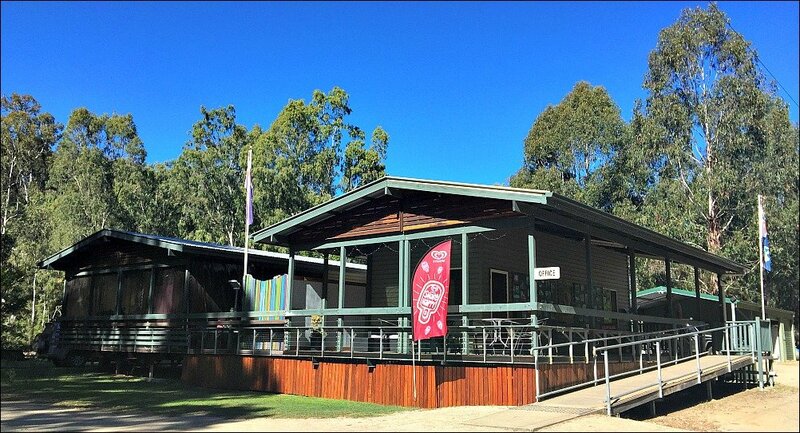 Kookaburra Cabin), Swimming Pool and fully fitted out Camp Kitchen. The hot showers were blissful. Don’t think showers out west are dirty if they have stained walls, it is from using underground water. Attractions. 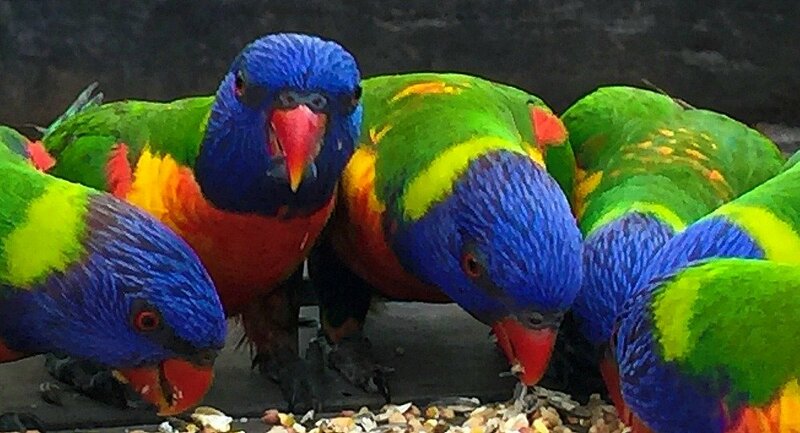 Bird feeding each day at 4pm attracts loads of screeching Lorikeets and more timid Galahs. Tall trees predominate throughout the park with a steep gorge wall backdrop. Advantages. Closer to all walks except Shamrock Mine Walk. Cost. $32/night powered site. Less $2/night RACQ discount. Pets allowed. Fires allowed in suitable containers. We stayed two nights and were very happy with all facets of the Retreat caravan park. If I were to return to Lake Cania I would stay here again. It is in quite a beautiful setting. This is a quiet natural style retreat. Position. 9km further into the gorge from Cania Gorge Tourist Retreat on the N-W edge of the National Park. Reviews. Good Reviews on WikiCamps App, with some people saying to park right up the back away from the crowds. Facilities. Cania Gorge Waterpark. Events Room. Jumping Pillows. Tennis Court and Kayak Hire. Advantages. Closer to Lake Cania and Shamrock Mine Walk. Lots of activities for children. Cost. $38/night powered site. Discounts for Big 4 members. We have not stayed at Cania Gorge Big 4 but I’m sure it would suit boaties and families. 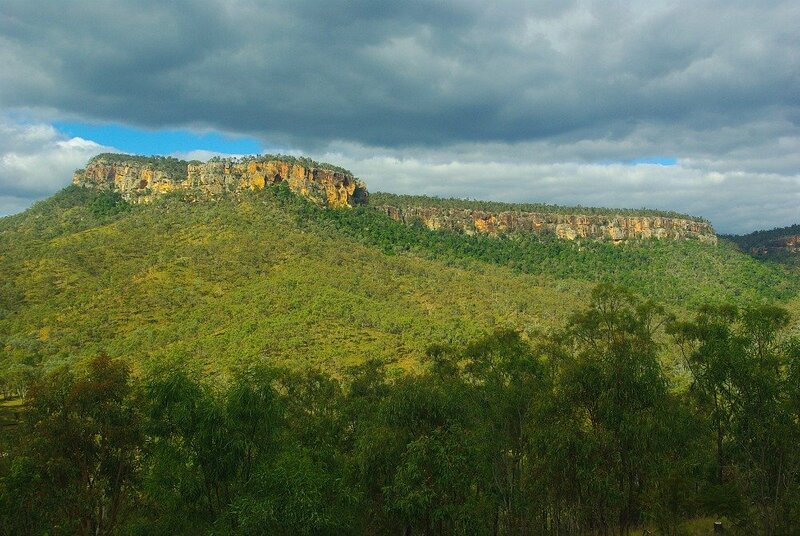 Cania Gorge National Park turnoff is 24 km north of the closest town Monto and a further 12 km off the Burnett Highway. The road is sealed the whole way including within the gorge. 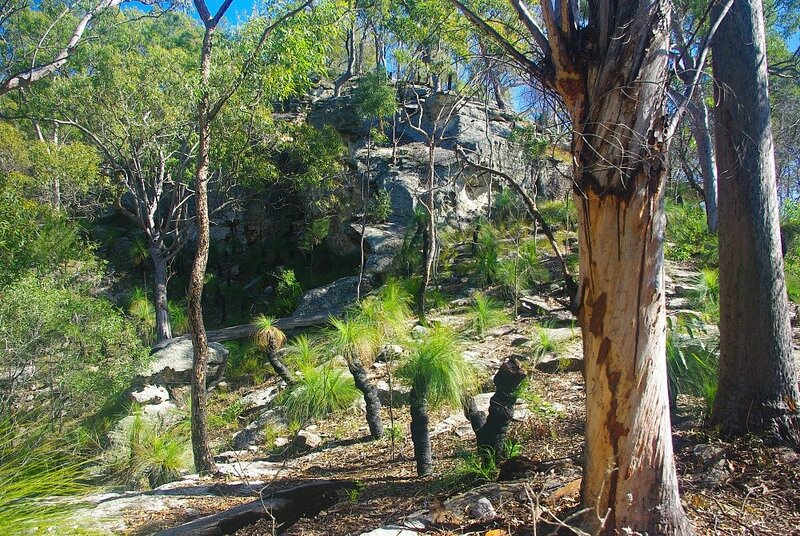 A few hours further north is Kroombit Tops National Park where you can find the wrecked Liberator Plane Beautiful Betsy in the Piccabeen palms and blue gum landscape. Betsy crashed in WWII and the site and war graves can be visited today along with a viewing platform with impressive views. 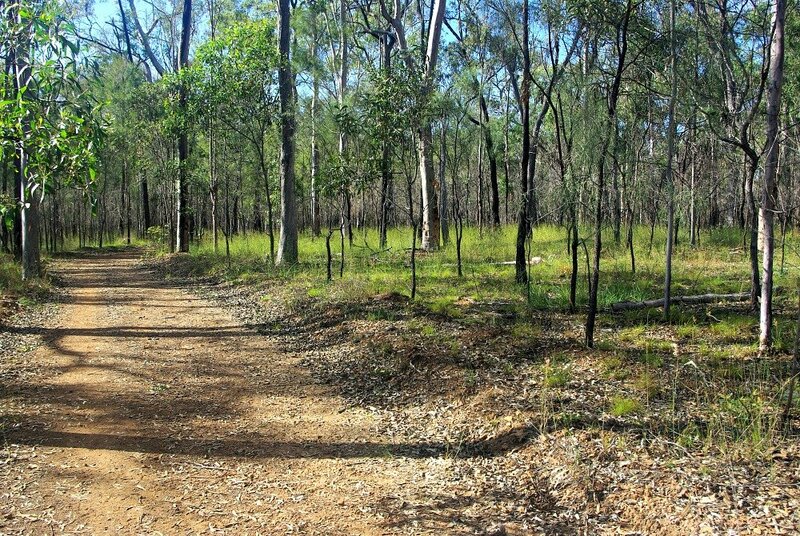 Kroombit Tops is a 4WD off-road destination with many tracks to explore. If your rig is 4WD off-road friendly you could get there on the roads below. On road vehicles should approach from Gladstone. 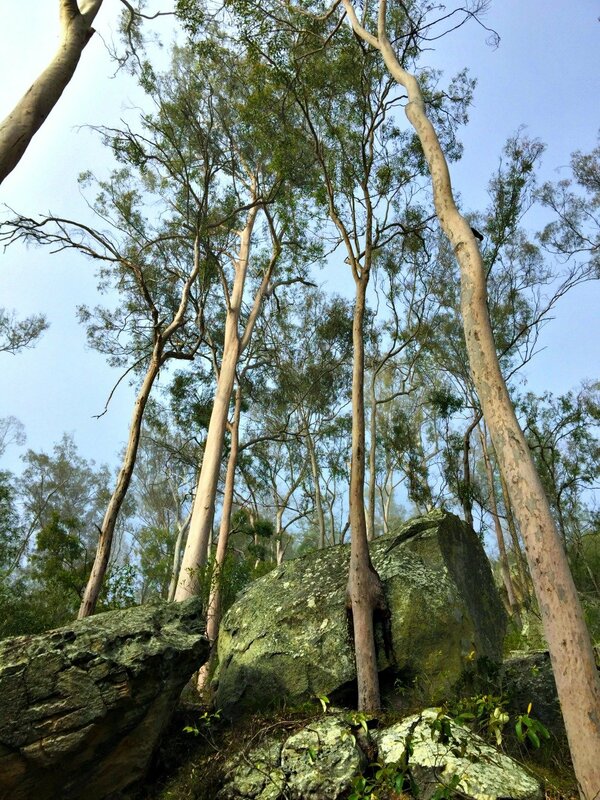 Check Kroombit Tops National Park for complete access details. December to February. Summer maximum temperature: 32 degrees. Overnight minimum: 18 degrees. June to August. Winter maximum temperature: 23 degrees. Overnight minimum: 5 degrees. Rainfall. The majority of rain falls in Summer with Nov/Dec/Jan/Feb receiving approximately 90mm/month. We drove the length of the Burnett Highway, starting 7 km south of Rockhampton and finishing in Nanango. I will be posting on this drive in the future. 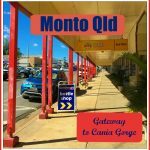 Having dropped in at Biloela for tourist information, coffee and a bottle of red for the campfire that night, we then drove south following signs and turning off to Moonford for the gorge. Thanks for reading and commenting – we really appreciate it. If you have a blog, please add a travel post to the link below for Nancie’s Travel Photo Thursday which we co-host with Ruth from Tanama Tales and Rachel from Rachel’s Ruminations. All links to blogs are DoFollow. That means I am sharing SEO link juice with you; a good thing! Thanks for this fabulous tour of Cania Gorge National Park. It’s fabulous that there are many different walks of varying length and degree of difficultly so that just about everyone can get out and enjoy the park. Queensland is moving up our list, so I need to keep this post on my refer back to list. Thanks for the tour. Happy travels. 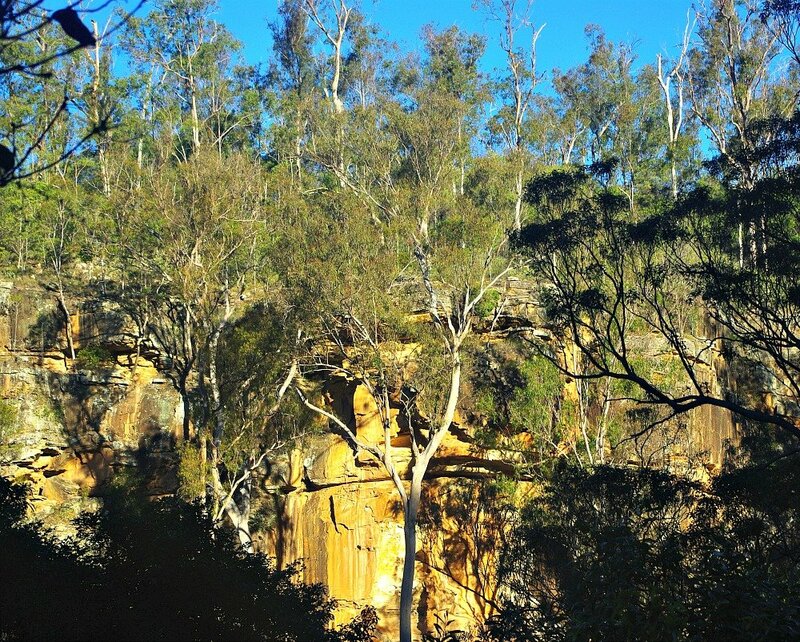 Carnarvon gorge is another you would like Jill. I love that Wallaby sanding tough! It’s the prettiest wallaby I’ve seen. It had a mate also who was out of frame. I was a bit far away but didn’t want to move and scare them. Cania Gorge looks amazing. It’s been on our list of places to visit for awhile now. Great photos too! Great post.. I am not very familiar with the place, so thanks for introducing it to me.. 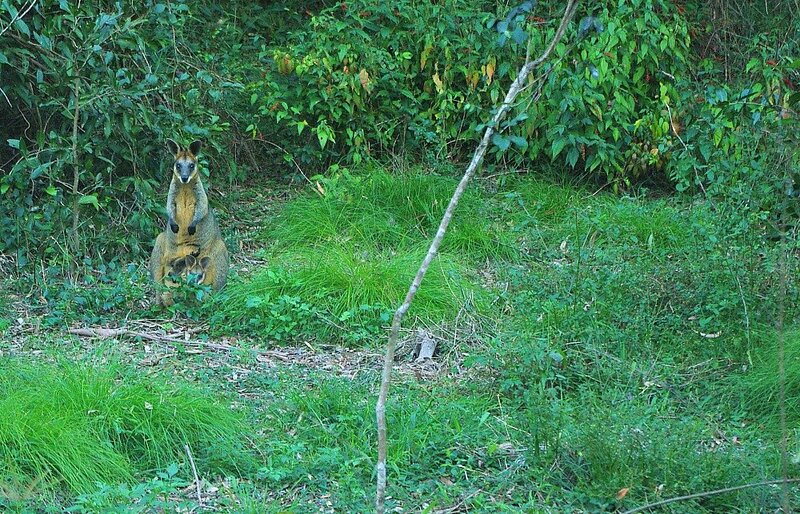 The wallaby is so ready for that shot.. I’m hoping to see one soon..
What a gorgeous national park! You took some beautiful photos of it. Especially that Whiptail wallaby! I’ve seen wallabies before but that one is just stunning! I was finding a good place for adventure for my next trip and I am glad to discover your blog. 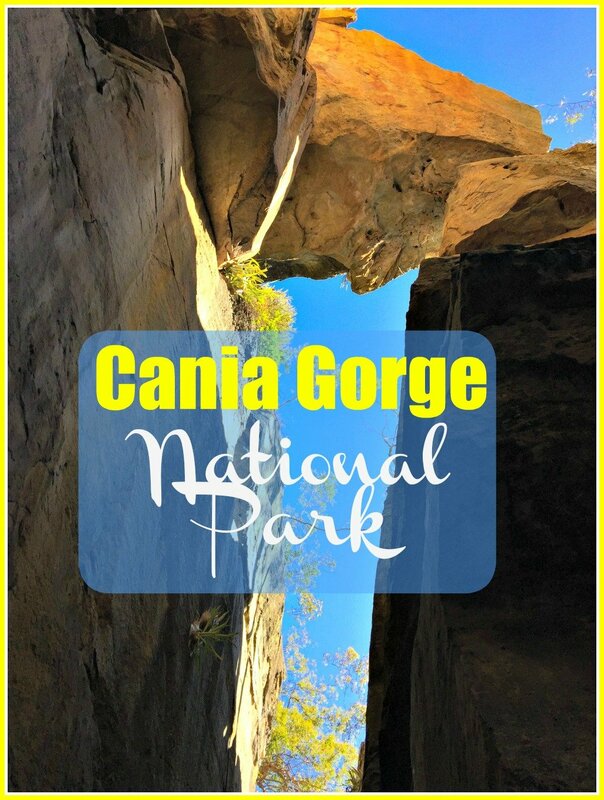 Thanks for proving really great information about cania gorge national park. Thanks for the insight. This area is on our list. A few years ago we bypassed this area and went Banana, Theodore, Taroom, Miles back to Brisbane after being out at Longreach. Give us a couple of ideas. Thanks for sharing. We’ve been to Longreach but after there we went to Roma and then back north. I’m looking forward to exploring more down this way. We’ve only been down here for 6 months. Wow, I’ve never even heard of this area, but your pictures & the scale of it! Just wow.